Where do you start when doing a discovery into so much content? We had 6 weeks to sensibly review and make recommendations about GOV.UK content for international users - not an easy task when GOV.UK has thousands of pages. We needed a way to decide what international content meant for this project. Without a clear definition anything could arguably be used by anyone in the world (worldwide web innit!). We came up with this definition: ‘international content tells you something you need to know or do that is different because of your nationality or your location’. This definition helped us review the content and the user needs. For example, a British person abroad may need to replace their lost driving licence, but they don’t do it any differently than a person in the UK. Therefore, we didn’t include it as an international user need. Once we had our definition we needed to review the content that was in scope. We decided the place to start would be to do an audit. This allowed us to understand what was currently on GOV.UK. It also told us how departments are communicating with users. Straight away we saw how big this was - over 33,000 pieces of content matched our definition. Because of the scale of the content we needed a quick way to review it. We decided the best way to do this was to review it based on who may need the content and what they may need it for. We found there wasn’t a clear distinction between professional and personal users, they’re all just people trying to do a thing. 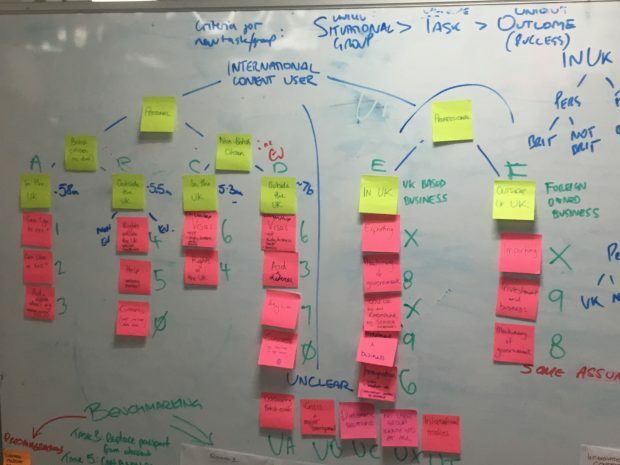 Whilst it wasn’t an exhaustive content audit, it helped us focus our efforts on international user needs in the context of our 6 week discovery. We’ll be publishing more posts about what we found out and what we’re planning on doing next.